The open-air mall actually had shops from around the world. Granted, while they didn’t highlight their cultural heritage, as the name of the center implies, it was nice to simply see representations of different cultures standing side-by-side. 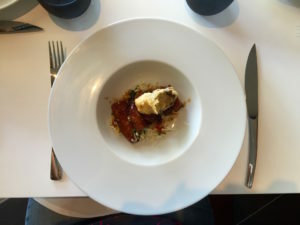 On the rooftop level, the food of local chef Roy Yamaguchi’s Eating House 1849 was served just a few steps away from that of Egyptian chef Michael Mina at Stripsteak. The highlight of the International Market Place though, was the huge banyan tree in the center, thought to be more than one hundred years old. Nuzzled between the winding branches was a small treehouse with the story of the “reincarnation” of the market place. Surrounding the iconic tree, there were small placards telling a brief history of Hawaii. 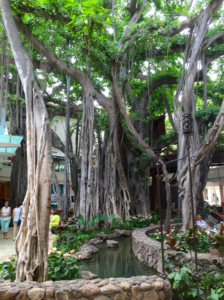 True, this new International Market Place isn’t the same as the old one, where local vendors sold handmade shell leis and miniature tikis, but the history of Hawaii stands tall through the stories of the banyan tree.